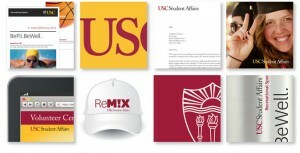 The USC Division of Student Affairs graphic identity is a system of coordinated design elements — logo, color palette, typography and formats — that connect the division to USC’s overall image. The university’s graphic identity system introduces a logo that incorporates the shield, two official typefaces and approved color combinations. The new Student Affairs logo is an important part of this system and must be used on all Student Affairs publications and Websites as well as on products and merchandise. The guidelines on this Website facilitate consistent use of our graphic identity system across various media and applications. For more information or assistance, contact Dane Martens at SAlogos@usc.edu.